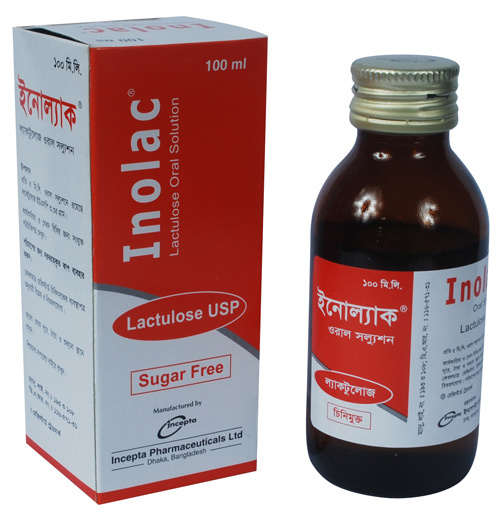 Inolac oral solution: Each 5 ml oral solution contains Lactulose USP 3.35 gm. Treatment of chronic and habitual constipation. the stages of hepatic pre-coma and coma. Adults: Initially 15 ml twice daily, adjusted according to patient's need. Hepatic encephalopathy: 30-50 ml 3 times daily, subsequently adjusted to produce 2-3 soft stools daily. Pregnancy Category B. Lactulose oral solution has been shown to be safe and effective for the treatment of constipation associated with pregnancy when administered to women at different stages of pregnancy.